This calibration specimen provides a means of testing scanning electron microscopes. The various sizes of the gaps between gold crystals grown on a graphite substrate allow tests for the resolution attainable under real operating conditions: concomitantly, the samples can be used to assess the quality of gray-level reproduction at high resolution. Ideally, high resolution scanning microscopes should give good results in the gap test combined with good gray level reproduction. Medium-quality instruments may achieve a chosen gap resolution, but the gray level production may be quite poor, for example, only 4 or 5 gray levels may appear. Gray levels arise in the secondary electron mode due to differential signal collection and this originates from geometric irregularities on the test specimen. Hence, the angular crystal faces in the larger gold crystals in this specimen can be used for the gray level assessment. As an aid in use, there is an outline image of a square mesh on the surface of the specimen: this is useful for preliminary focusing at magnifications below x150. In addition, if the user wishes to preserve the specimen then tests can be done on known areas leaving other areas un-irradiated. For a demanding assessment of the imaging qualities of the microscope, the microscopist may wish to view the very fine array of particles present in the boundary region between evaporated gold in the grid squares and un-coated graphite in the grid bars. When assessing the secondary electron image quality, the sample is best viewed using a specimen tilt of 30 degrees to the secondary electron collector. The degree of stage tilt used in back-scattered electron testing will depend on the position of the detector. It is better not to view the sample in any mode with a tilt greater than 35 degrees since the height of the larger crystals may be such that the small crystals become shielded from view. If gap measurements are to be made it should be remembered that the magnification is not constant throughout the image when the sample is tilted. The gold crystals are difficult to visualize on the VDU when the SEM is working below x 40,000 magnification. Other than giving this simple comment, recommending conditions for SEM resolution and gray level testing is somewhat difficult since there are many levels of sophistication available in the current generation of instruments. As a general guide, the operator will be aiming to use the test specimen at a fairly short working distance of a 7 or 8 mm. The best probe sizes are available at higher probe energies, so a gun potential of 20kV or above should be chosen for the initial testing. Subsequently it may be of interest to examine the performance of the SEM at lower gun potentials: however, unless the SEM in question has a dedicated facility for high quality imaging at below 10 keV, there will not be much point in attempting work at this level. It is important that the filament is correctly saturated and that the gun is working efficiently in terms of beam brightness and stability, that the apertures are carefully centered, and that the astigmatism and fine focus are carefully checked immediately prior to recording the image. For ultimate performance the stage should be mechanically stable , there should be a good chamber vacuum, and the stray field and ambient vibration level in the SEM room should be below the recommended level set by the SEM manufacturer. (The Gauss Maus, B7461, is ideal for routinely checking the stray AC field level). For recording, if the variables are available, the largest number of scan lines per frame resolvable on the recording screen should be used, and a long recording time is recommended (up to 10 minutes may be available on some instruments) which should ensure a good signal to noise ratio. If the operator is looking for good gray level reproduction, it is very important that the recording camera lens is well focused and that the photographic processing is carefully controlled for the best gray range available. Measurements of gaps can of course only be made after a careful magnification calibration of the SEM , and the microscopist must be satisfied that the calibration is rigorously applicable to the micrograph recorded of the Au/C test specimen. Set up the SEM then insert the sample and await a good vacuum. Switch on the gun and saturate the filament carefully. Starting at a low magnification (below x150), focus on the edges of the dark grid bars and search for a suitable square of gold. Raise the magnification to x500 and focus on an irregular portion of the gold film. Increase the magnification to x40,000 keeping the specimen in focus. Shift the specimen to image an area well within a grid square (if the stage is tilted, use X-shift for convenience so that you do not lose focus): now focus carefully on the gold particles. Raise the magnification to x80,000 (or above) and make final adjustments to the stigmators and the fine focus controls. The latter adjustments should be performed quickly if the SEM is prone to contamination deposition. Record the image using a very slow probe scanning rate. 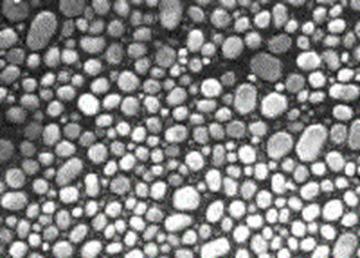 Gold Particles On Carbon High Resolution SEM Calibration Specimens are available online from the MS Catalog. For ordering or product information, click here.